Your instrument has been completely adjusted and set up by our technicians. Due to shipping, personal playing preferences and circumstances beyond our control, some minor adjustments may be required. If you are inexperienced with any of the following procedures, take your instrument to a qualified repairperson. The adjustments in this book are for reference purposes only. Zon Guitars assumes no liability for damage to the instrument caused by improper adjustments or modifications as a result of viewing this information. Your instrument is equipped with a two-way adjustable Zon bridge. Adjustments to this bridge optimize string height and intonation. Adjusting string height. Insert the 1.5mm hex key (supplied) into one of the small hex screws located at the corner on each side of the saddles’ leading edge (see Fig. 1). Turning the hex key clockwise raises the saddle, increasing string height. Turning counterclockwise lowers the saddle, decreasing string height. It is important that the saddle heights follow the fingerboard radius for proper playability (see Fig. 2). To check this, sight down the fingerboard from the nut toward the bridge and make sure that the saddles follow the curvature of the fingerboard. Setting intonation. Adjust the Phillips-head travel screw on the ridge’s back edge (Fig. 3). Rotating this screw counterclockwise moves the saddle forward (toward the neck), causing the string pitch to raise (become sharp). Rotating the screw clockwise moves the saddle backward (toward the bridge), causing the string’s pitch to lower (become flat). The instrument is perfectly intonated when the harmonic at the 12th fret and the fretted note at the 12th fret are equal in pitch. For more information on adjustments, visit the Zon Guitars web site, at http://www.zonguitars.com. The pickups on your bass should be set for equal balance of volume from the neck to the bridge position, as well as from string to string. The pickups should be set close to the strings for maximum output, but not so close that the strings contact the pickup surface when played. String contact with the pickup will mar the surface and send unwanted transients through your amp, possibly causing damage to it. Please note: When adjusting pickup heights, care should be taken not to overtighten the screws, as damage may occur to the pickup. Adjusting the narrow-bar-style pickups (Fig. 4). With a small Phillips-head screwdriver, adjust the screws located on either edge of the pickup to achieve the desired height. 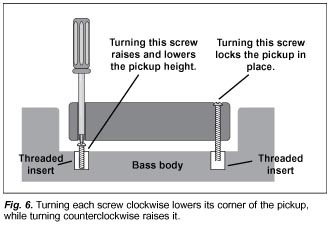 Clockwise rotation of the screw lowers the pickup. Counterclockwise rotation raises the pickup. The machine screws used to secure the pickups feed into threaded inserts set into the body. This provides smooth adjustment and prevents the screw from stripping the hole, a common problem when regular wood screws are used. Adjusting the soapbar-style pickups (Fig. 5 & 6). To begin, the mounting of these pickups was designed to eliminate springs and provide a rigid fix to the body. In this design, two screws on the pickup’s face pull down while two screws located through two holes in the pickup push up. With a medium Phillips-head screwdriver, locate the screws on the pickup’s upper treble-side corner and lower bass-side corner. Rotate these screws counterclockwise—just enough to break them free. Next, locate the holes at the pickup’s lower treble-side corner and upper bass-side corner. Insert a #0 Phillips-head screwdriver into the holes, alternately rotating the screws clockwise to lower the pickup or counterclockwise to raise the pickup. By manipulating the screws’ height, different angles of pitch to the pickup can be achieved, helping to fine-tune the pickup’s positioning and balance. Adjusting 3-screw pickups. Zon Sonus 4/1, 4/2, 5/1, 5/2 basses are equipped with pickups that have three adjustment screws—two on the bass side and one on the treble side. 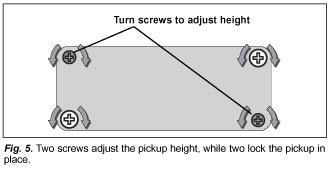 With a small Phillips-head screwdriver, adjust the screws located on either edge of the pickup to achieve the desired height. Clockwise rotation of the screw lowers the pickup. Counterclockwise rotation raises the pickup. The machine screws used to secure the pickups feed into threaded inserts set into the body. This provides smooth adjustment and prevents the screw from stripping the hole, a common problem when regular wood screws are used.